These are two small watercolor paintings on Aquabord that I have on exhibit at the Copley Society of Art in Boston for the fall member’s small works show. I just love the way the watercolors POP on the Aquabord surface! 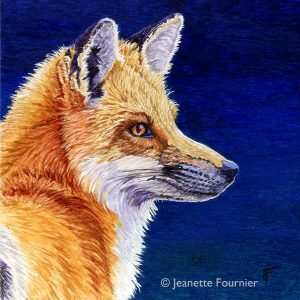 The show is up until November 8th so you still have a little time to get down to the gallery, if you are looking to add a little color in your life. 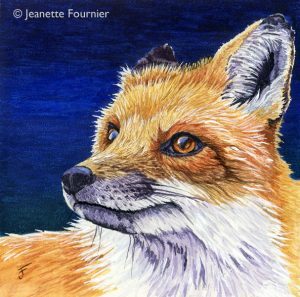 This entry was posted in Exhibitions and tagged animal art, art exhibit, Boston art show, Copley Society of Art, NH Artist, red fox, watercolor art, white mountain artist. Bookmark the permalink.